Tech is a small world – is it a good idea to burn bridges? I’m also answering an email about how to run meetings more effectively. Our John Maxwell Thought leader segment is all about influencing others and I’ve got a family segment where we talk about how to communicate more effectively. Child 1: Daddy, I want to know, can I set up a lemonade stand? Child 2: Dad, can I use a tape measure to measure my jump rope? Announcer: “Becoming a Geek Leader,” Season 3, Episode 4. Sponsored by Bright Hill Group’s Professional Speaking Services. Tom: Are you a member of a professional association? Is your regional state or national group planning their upcoming annual meeting? I can help your meeting planners with keynotes and workshops on topics like communication, leadership, delegation, planning or conflict resolution. Also, is your company planning an all-hands meeting? I can help your leaders plan a productive and memorable event. I can professionally facilitate your meeting and deliver content that is completely aligned with your goals. Here’s what Erin Kwan [SP] said after having me speak for her state-wide association. Erin: I really enjoy working with Tom because he is practical and down to earth. He brings really good content. He’s very engaging as a speaker. And I think the audience really connects with him. They not only get good content, but they also get an entertaining presentation. So I would definitely recommend working with him. I will certainly call him in the future for any events that I have. Tom: Check out brighthillgroup.com/speaking, that’s brighthillgroup.com/speaking for testimonials, videos of me on stage, information about my most popular topics and more. Welcome to the “Becoming a Geek Leader” podcast. My name is Tom Cooper. As a geek, I’m on a mission to figure out better ways to lead others at work and at home. Through the “Becoming A Geek Leader” podcast, I’m sharing what I’m learning so I can help make you more effective at leading people, too. Ready? Wow. I just wanna take a minute to say thank you. I was just going over the stats for the podcast and November has been my biggest month ever. It’s a privilege to be a part of your day so thank you for inviting me along. If the podcast is helping you, would you please take a moment to pass it along to someone else who would appreciate it? All right, let’s talk about today’s episode. We’re gonna talk about how tech is a small world so it’s a good idea to stay on good terms with everyone. You never know where you’re gonna see that boss of yours again. I’m also answering an email about how to run meetings more effectively. Also, our John Maxwell “Thought Leader” segment is all about influencing other people, and we’ll wrap up with a “Family” segment where I talk about how to communicate with others more effectively. Let’s get started. Man: At Level one, you may even be a superstar technical resource. Level one focuses you on improving your technical skills. Tom: I wanna talk about the topic that is near and dear to my heart. 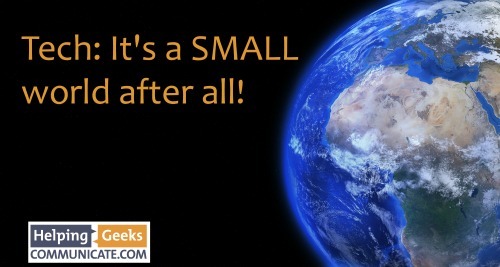 It’s the fact that the technology world is a small world, seriously. I was talking with the head of HR for a company recently and she’s been working on the issue of what they call regrettable churn. Now, regrettable churn is a term that HR folks use when they talk about when talented people, people they would love to have continue to be a part of the team, it’s when those people choose to move on. And just today, I was talking to some team members of the client and I heard several stories about how they’d each chosen to leave prior jobs. And we know that people move on. Sometimes, it’s a good thing for you and a good thing for the company. Sometimes, they just can’t give you what you need in order to be successful. Maybe you’ve outgrown the position or the opportunity or the pay grade that they’ve got for you. That’s really happened to me in my career. But sometimes, they change their priorities and they end up letting you go through no fault of your own. I’m working with a client right now that’s doing some prioritizing of resources in different places around the globe and they’re moving jobs from one part of the world to another part of the world. And some people are being let go not because they’re bad performers but because of other decisions the company is making. And sometimes, the fact is, they let you go because you’re not delivering. But regardless, I wanna talk about how to leave a job well. We know that in a tech world, there are lots and lots of opportunities, and it’s difficult to make technology work. It’s difficult for systems to work. And there’s plenty of grass out there that certainly looks greener. Just to wrap some numbers around that. A while back, I did some work with the Charlotte Chamber of Commerce and discovered that there is a systemic and persistent deficit of good candidates in this market. In fact, there are more than 18,000 jobs a year that go unfilled because it’s so hard to find good team members. So it seems like if you’re a technology person, there’s always an opportunity out there. But let’s get back to that head of HR who was telling me about a team member who chose to leave. This was an engineer who was smart and hard-working. After several years working for this employer, she decided to go to find greener grass someplace else. She negotiated her new deal with the new employer and then she went to her boss and she gave her two weeks’ notice. That’s normal. That’s right, isn’t it? Except for the fact that she refused to communicate with anybody at her current employer about her future plans. “I’m leaving.” “Where are you going?” “I don’t have to disclose that.” And she didn’t. And she’s right. She doesn’t have to disclose it. But here’s the funny thing. As I was preparing for this episode, I’d spent literally less than 10 seconds to find out exactly where she went. She wasn’t helping her relationship. She was just being rude. Now, Maya Angelou said, “People never forget how you make them feel.” People never forget how you make them feel, and I think that is absolutely right. But so what? I mean, there are tons of jobs, especially in a city like Charlotte. It’d be easy to find another job. Now, that’s true. But in spite of the fact that over a million people live in this metropolitan area, the number of people who make decisions at the senior levels is actually pretty small. And I’d been in this town for about a year when I was reminded of that. I had connected with a tech guy and we had several conversations. And during one of our conversations, he said, “Oh, Tom, Elizabeth was here over the weekend and she saw that card you sent me. And she said, “Hey, I know Tom. I knew him first.” And it’s true. I had met Elizabeth through a non-profit she works with after I’d been here only a couple of months. But here’s the thing, it never occurred to me that even though they shared the same last name, they might be related. 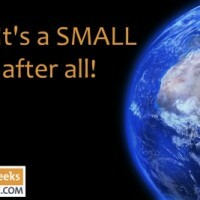 It is a small world and you don’t realize how small it is because just like “Six Degrees of Separation” from Kevin Bacon, there’s fewer degrees of separation between the people who work in the tech world no matter where they are in the world, seriously. Now, as you move up in your career, how you end things is just as important as how you start them. And if you leave on a bad note, especially when there’s not a good reason to leave on a bad note, it leaves a bad memory about how you made someone feel bad. And that’s gonna be as big a factor in their communication about you as the quality of your work was, even if your work performance was amazing. Now, you might say, “Well, they shouldn’t care. My work was excellent. And if they say something bad, I’ll just sue them.” Well, maybe. But you’d lose and you’d waste a lot of time and energy in the process. And not only that, but you’ve got to realize that the people you report to in your new company, they probably have a connection to the people in your old company. They might live in the same neighborhood. They might be in the same volunteer organization. They might go to the same church. Their kids might go to the same school. They both might be members of the same professional association. And in their outside-of-work world, they might have an off-the-record conversation where they say something not so great about you. And they might even say something that’s factual that’s not so great about you. “You know, the quality of his work was pretty good, but I don’t like the way he left.” That’s all they have to say and it’s amazing the impact that that has. But what if you left your employment in such a way that they were actually sad to see you go? Now, I’ve changed jobs many times over the course of my career and I’ve not done it perfectly every time. But when I left my first job in Washington DC, that must’ve been back around ’92, I know they were sad to see me go. I know because they ended up hiring three people to replace me so I was pretty confident I’d been delivering good value for them. I didn’t realize how much of a difference that made to them until probably 15 years after that. I got an email from my former boss and he told me how much he appreciated my work ethic, my integrity, and my commitment. Now, let me ask you. If somebody asked about you from even 10 years ago, would your former boss remember you? And would their memory be a good one? All I’m saying is it’s a small world, a really small world. Just yesterday, I had an email from somebody I worked with before. We were in the same IT organization more than 10 years ago. He reached out for help with a problem his team is facing. It’s a small world. We just can’t afford to burn bridges. If you’ve got the opportunity, take the high road. The high road is worth it. And that’s today’s “Mentoring” segment. Tom: In the “Coach’s Mailbox” segment, today, I’ve got an email from Gail. Now, this topic that Gail brings up is something that you’ll be able to use when you’re at Level two of the four levels of thinking as a geek leader. Announcer: Level two, team member. Man: Level two is where you work well with others, and together, you all succeed. Gail, I feel your pain. Back in the day, I was a young engineer, my boss suggested I run the team meeting, and I thought, “How hard could that be? We just sit around and we talk. I like to talk.” Turns out it wasn’t anywhere near as simple as it looked. Running a meeting, it’s a skill and it’s something that you will need to hone and develop in your career. I don’t have time to get into all the aspects about running a meeting but I do wanna share some key points with you. Now, when it comes to your meetings, why are you meeting? There are three different goals that you might have for a specific meeting. One, you might need to make a decision. So decision-making is one reason to have a meeting. Two, you might wanna broadcast update information out to people. You wanna let them know what’s going on. So that’s the second reason for a meeting. The third reason for a meeting is collaboration or problem-solving. So when you’re getting ready to have your meeting, you need to understand, what is my goal? Most project meetings are really about collaboration or problem-solving, and that might be your goal. With that goal in mind, are you inviting the right people? If you are inviting the right people, are you using their time efficiently? Do you have a plan, a written agenda that you send out before the meeting? And I’ll tell you, just creating your agenda is gonna make your meetings better, and the time you spend thinking and planning that agenda, that’s gonna help you have a clear focus on your goals for the meeting and helping the team. When you get ready to have the meeting, at the very beginning, start off by going over your agenda and the goals for the meeting. Just like when you’re getting on an airplane, they said, “This plane’s going to Dallas. If you’re not going to Dallas, now’s a good time to get off.” When you start your meeting, you can go right in and say, “Here’s what we’re gonna do today.” And that way, people can be engaged in the process. So here’s how you’re laying it out to make it easy for people. Let’s say you had something that was totally off-topic that was brought up and you put it in the parking lot. You could say, “All right, as I look at the parking lot, Roger brought up D. I’ll schedule a meeting in the next two weeks to talk specifically about D. Roger, will that work for you?” And now, you’ve elaborated on the things that everybody was supposed to do during that meeting. John: Hello, I’m John Maxwell. And as one of my founding partners, Tom has been trained by me and my team. Tom: In our John Maxwell “Thought Leader” segment today, I wanna introduce the law of influence. This is our second law from John’s book, “The 21 Irrefutable Laws of Leadership.” It’s a great book on leadership and I just wanna kind of dip our toe in the water of what that means. So the law of influence says, “The true measure of leadership is influence, nothing more, nothing less.” The true measure of leadership is influence, nothing more, nothing less. Now, you think about leadership, I heard a quote from Margaret Thatcher. She said, “Being in power is like being a lady. If you have to tell people you are, you’re not.” The more influence you have, the stronger your leadership is going to be. If you have low levels of influence, you’re gonna have low levels of leadership. Leadership is influence and your ability to influence people comes from valuing people. Now, I know it’s an old expression, but people don’t care how much you know until they know how much you care about them, about their problems. And if you take a genuine interest in others, your influence is gonna grow with them. I have to tell you, when I first got started, I thought leadership was all about me. And then I began to recognize that people didn’t think the same way I did and maybe that wasn’t right. So I shifted and I pretended it was all about others, but secretly, I still thought it was about me. And then many years later, I realized that I had been entirely wrong, that it was all about them, that it’s influence, that it comes from adding value and really caring about other people. One of my mentors is Zig Ziglar. My dad pointed me to him years ago. He’s a sales guru. And Zig Ziglar said, “You can have anything in life that you want if you help enough other people get what they want.” And a lot of people just don’t understand that. Now, how do you help other people get what they want? Well, it really comes from thinking differently. Instead of thinking about, “What have you done for me lately,” you start thinking about, “How can I help you? What can I do to make a difference?” When I change my focus from me to you, all of a sudden, it’s different. And what if you ask questions like, “Are you getting all the support you need from me? What support do you need from me? What can I do to help you grow?” When you begin to do that, all of a sudden, the amount of influence you have with others begins to just skyrocket forward. Years ago, I was teaching a class on leadership and one of the participants said to me, “Tom, leadership and management are the same thing,” and I said, “Steve, I am so glad you are here.” It gave me the opportunity to share with him that that idea, that management and leadership are the same, is one of the five most common myths about leadership. And people frequently do get management and leadership confused. Management can be a part of leadership. But just because you can manage something efficiently, that doesn’t mean you’re a leader. Management is about doing things right and leadership is about doing the right things. Management is about doing what we did yesterday more efficiently and consistently in control, managing risks. But leadership is providing direction, enthusiasm, and inspiration. It’s really about influencing other people. People often think management and leadership are the same, but they’re absolutely not the same thing. If you’re focusing your time and attention on the little things, to make sure that people are coming to work on time, or how long they’re at lunch, that’s not leadership. It’s just not leadership because it’s very different to work for a boss who’s watching the clock all the time from watching a boss or working with a boss that is inspiring a team and that where the team is focused on delivering towards an amazing goal. All right, another myth is the entrepreneur myth, that entrepreneurs are great leaders. But if you stop and think about that, that doesn’t make any sense. Just because somebody identified a gap in the market and created a new product, that doesn’t mean that they’re actually leading other people. There are plenty of people who are inventors and entrepreneurs who aren’t making a dime, or who can’t grow their team past a certain point. And we touched on that last week, when we talked about the law of the lid. How about knowledge, that knowledge is power? Now, I’ll tell you, as a geek, oh, my goodness, this one is so rampant. “I’m the smartest guy in the room about Technology X. Therefore, I have all the power about that.” Yikes. That is totally not true. You cannot force people to follow you. And you know that’s true because you have found in your career, there were plenty of times where you had the right answer but people just wouldn’t listen. And you found yourself going back a while later going, “They should’ve listened to me. They just should’ve listened to me.” And maybe they should have, but your knowledge didn’t give you the influence that you needed. Next is the pioneer myth. You know, whoever got there first, the pioneer, the one who’s carving a new trail that they’re a leader. But that’s not true. There are plenty of people who are pioneers who are loners, who are off on their own. And it’s not the same thing at all as taking initiative. And finally, the position myth. Now, this one is the biggest misconception of all, that once I get the position, I’ll be a leader. I can tell you, I have held positions with a leadership title where I have not led very well. And I have held positions where I did not have a leadership position where I actually did a halfway decent job of leading and influencing others. The same is true for you and it’s true for everybody else. It’s not the position that makes the leader. It’s the leader that makes the position. If you’ve got a position, it might give you a temporary head start when you first meet new people, but it’s not gonna keep you there for very long. If you don’t have influence, if you can’t lead, you just won’t be effective. Leadership is influence. That’s the law of influence, that it’s our ability to influence others, nothing more, nothing less. It’s a simple point when you stop and think about it but it’s so easy to miss until you do that. If you wanna be a leader, you’ve gotta have followers. And here’s the thing. In today’s world, people are not gonna follow you unless they want to follow you. The law of influence, the true measure of leadership is influence, nothing more, nothing less. And that’s today’s John Maxwell “Thought Leader” segment on the law of influence. Tom: Now, in the “Family” segment, what I have to talk about today is something that you can use at Level one of the four levels of thinking as a geek leader. Tom: In today’s “Family” segment, I wanna talk about how other people think differently than we do. Our priorities are frequently very different from theirs. And I wanna illustrate that by some early-morning visits from my seven-year-old and nine-year-old daughters. Now, I should say that morning is not my best time. I’m often groggy until I’ve been up for an hour or two. So if you wanna get something from me, it’s probably best for you to give me a little bit of time to get moving. Nevertheless, it’s not an uncommon experience for my kids to be bright-eyed and bushy-tailed and be raring to go and excited about opportunities to start their day. Here are a couple of recent burning questions that necessitated an early-morning knock on my bedroom door. Tom: Just like I wasn’t particularly interested in jump ropes or lemonade stands when those questions were asked, when you approach somebody else, it’s likely that their minds may be preoccupied with other thoughts. As I was getting ready for this episode, I was reminded of commentary that Dale Carnegie provided on an advertising letter he received. Before you ask your question, you should ask yourself, “What does the other person want?” We get so wrapped up in thinking about the things that we want that we overlook the things that might be important to the other person. If you can put your brain in their position, if you can think about the things that matter to them, it changes the interactions that you have. So certainly, you can’t be responsible for handling somebody’s medical problems or their financial problems or their family problems. But you know what? You might be able to listen to them talk about those issues because in our culture, people don’t listen very often. And even if you can’t address or solve those issues, you might be in a position where you could at least connect with them about those issues. And they’re gonna want to do things that matter to you if you can make it a priority to hear from them before you launch into your request. In fact, one of my clients said to me he did an exercise where he made it a point one day to say, “Every time I make a statement, I commit to asking three questions.” So instead of just talk, talk, talk, he would say something and then intentionally ask a sequence of three questions. He said it made a dramatic difference in the type of interaction he had with other people. I thought it was a great idea. So the fact is people are thinking about things that are not the things that matter to you. And the more you can do to get inside their head, the more likely you are to get the kinda response that you want. Now, for the record, the jump rope turned out to be 6 feet 6 inches long and that particular day was too cold for a lemonade stand. And that’s today’s “Family” segment. Tom: So to recap. In today’s episode, we talked about how technology is actually a small world, and we have to be careful not to burn our bridges because people never forget how you make them feel. We also covered a couple of aspects of effective meetings, how having a solid plan and doing a quick recap at the end of the meeting is a powerful way to close it out. In our John Maxwell “Thought Leader” segment, we talked about myths of leadership and how important influence is. And in the “Family” segment, we talked about how other people are distracted by things unrelated to our concerns and our priorities. Is the podcast helping you? Make sure that you don’t miss out on the latest info. Head over right now to brighthillgroup.com/join to be sure that you stay in the loop. When you do, you’ll get my PDF, “Become a Geek Leader in Two Easy Steps,” and you’ll be notified as soon as new podcast episodes are available. Plus, you’ll get updates and ideas that I don’t share on the podcast. Head over to brighthillgroup.com/join right now. This is Tom Cooper. Thanks for listening. Be sure to join me next time for another episode of “Becoming a Geek Leader.” Join me in my mission of discovering better ways to lead others at work and at home.